The recovery of the equities markets after the economic downturn of 2008-2009 has led to more successful business owners, professionals and other individuals with more than $1,000,000 in their IRA account. Many of these IRA owners have multiple sources of income as they approach their retirement years. These IRA owners understand that Required Minimum Distributions (RMDs) must be taken from their IRA starting when they turn 70 ½. The question that typically arises in their financial planning is “what should I do with the after-tax amounts from my RMDs?” For IRA owners with multiple sources of income, the answer to this question is generally to allocate the funds as some form of inheritance to their heirs. Should these after-tax dollars be re-invested in their non-guaranteed financial asset portfolio? Or is there a more tax efficient way to re-allocate these funds that would provide a larger inheritance for their family? 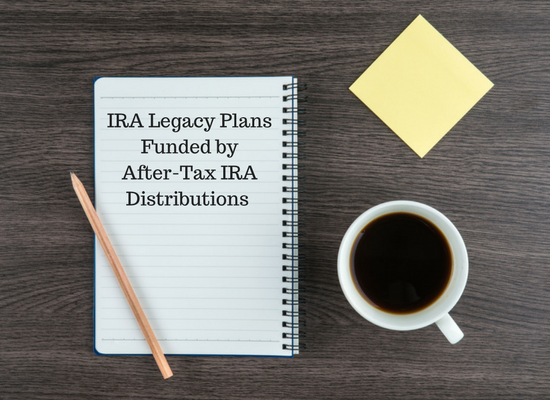 This concept is commonly known as the Inherited IRA Legacy Plan. Under this plan the after-tax RMDs are allocated for the annual premium on a no-lapse UL or no-lapse SUL life insurance product. The income tax free life insurance death benefit can provide a larger inheritance than simply re-investing the after-tax RMDs in an asset portfolio with taxable yields. This is especially true in the low-interest economic environment for fixed financial assets. Step 1: Create an income stream from the IRA by taking distributions.Keep in mind, an IRA owner doesn’t need to wait until age 70 ½ to take out distributions. Starting prior to 70 ½ may work when coupled with a life insurance program because of the potential higher premium cost of waiting due to the onset of certain medical conditions and/or age. Step 2: Determine ownership structure of life insurance.The income stream from the IRA is taxable, but the after-tax dollars can be used for a premium on either personally owned life insurance or insurance owned by an irrevocable life insurance trust (ILIT). The decision on personal ownership or ILIT ownership will depend on factors such as the value of the IRA and the size of the gross estate in relation to the $5.49 million (single) and $10.98 million (married) federal estate tax exemption in 2017. Also, the size of the death benefit may dictate ownership by an ILIT depending on whether the IRA owner has an estate large enough to incur federal estate taxes. IRA owners may be exposed to state death taxes as well, because of the lower tax exemptions of many states that still levy such taxes. Step 3: Determine who shall be named as the beneficiary of the life insurance.Is it the children of the IRA owner outright or an ILIT for their benefit? Or is it an ILIT for the benefit of the grandchildren of the IRA owner? Step 4: Who shall be named as the beneficiary of the IRA?Is it the children of the IRA owner outright or a trust for their benefit so the inherited IRA can be paid over the children’s life expectancy? Or is it a trust for the benefit of the grandchildren so the inherited IRA can be paid over the longer life expectancy of the grandchildren?Note 1: President Trump’s tax reform proposals include elimination of the federal estate tax. Stay tuned for future developments as the U.S. Congress crafts its tax reform bills.Note 2: The U.S. Senate Finance Committee has developed a tax position on inherited IRAs that would limit post-death distributions to only 5 years by eliminating life expectancy payouts. At this time, it is unclear whether this change will be part of a larger tax reform package being developed by the U.S. Congress. Other sources of retirement income: Social Security benefits, income from rental properties and interest, dividends, and capital gains from their non-qualified asset portfolio. Combined federal and state income tax bracket: 35%. Option #1: Place After-Tax RMDs in an Asset Allocation Portfolio at 5% After-Tax Rate of Return (ROR) – Result, after 20 years, $852,000. The joint life expectancy (check out the Life Expectancy Calculator) of a male 71 / female 70 from the government joint life expectancy table is about 20 years. Option #2: Place After-Tax RMDs in a No-Lapse Survivorship Universal Life (SUL) Policy – Result after 20 years, $1,172,000. The IRR at year 20 joint life expectancy is 7.72%. In a 35% tax bracket, the pre-tax equivalent IRR is 11.88%. Instead, if very good health was able to provide a Male 71 Preferred NS and a Female 70 Preferred NS medical underwriting result, the $24,528 annual premium would purchase a guaranteed SUL death benefit of $1,352,000. The IRR at year 20 joint life expectancy is 8.90%. In a 35% tax bracket, the pre-tax equivalent IRR is 13.69%. The net inheritance to the heirs could be improved by about $320,000 to $500,000 at joint life expectancy by purchasing the SUL policy when compared to alternative fixed financial assets. The SUL life insurance provides a guaranteed no-lapse benefit vs. a non-guaranteed accumulation value of the alternative fixed financial asset. The non-guaranteed cross-over point where the financial asset hypothetically exceeds the guaranteed standard underwriting SUL insurance death benefit does not occur until year 25 when the younger insured, if still alive, is age 95. The non-guaranteed cross-over point where the financial asset hypothetically exceeds the guaranteed preferred underwriting SUL insurance death benefit does not occur until year 27 when the younger insured is age 97. The SUL life insurance could be owned by an ILIT so that the death benefit is estate tax free for state death tax purposes. The $5,000,000 taxable estate in our case study above would generate upwards of about $391,000 of state death taxes in a state which still uses the tax table from IRC Section 2011. Part of the SUL death benefit could be used to offset these state death taxes with the rest of the death benefit managed by the trustee for the benefit of trust beneficiaries. The remaining IRA value at the death of the client is paid outright to children or to a separate trust for the benefit of children or grandchildren as an inherited IRA. The RMDs using the Single Life Table can be stretched over the remaining life expectancy of the heirs depending on the dispositive provisions of the trust document. Using this inherited IRA stretch method, the income taxes to the heirs are spread out and paid annually over many years into the future rather than paid in a lump sum and taxed all in one tax year.